The largest post-acute physician company in the United States climbs to 245 wound-specialist physicians. Vohra physicians are provided clinical oversight and management as a part of the corporate culture of physician support with the ultimate goal of improved healing outcomes for all patients. Dr. Dennis Ng, M.D. leads a recent peer review session with several Vohra physicians in Las Vegas, NV. "A company that doesn’t do peer review, that doesn’t share that knowledge, just can’t equal that fund of knowledge-base that we have at Vohra Wound Physicians.” - Dr. James Kramer, M.D. Vohra Wound Physicians is excited to build upon their position as the largest group of post-acute physicians in the Nation. While continuing to grow, the company’s team of physicians recently expanded to 245 wound experts. Vohra physicians provide wound management services at more than 2,500 facilities across the United States, helping to heal well over 1,000,000 unique wounds. Over the last 17 years, the company has built the infrastructure to support these physicians and their practices in 27 states. Part of that infrastructure includes clinical affairs oversight for their clinicians. The Vohra physicians go through peer review, chart audits and site visits regularly to ensure they stay up to date on the standard of care and any new advancements in the field. This ensures all of Vohra’s patients are getting top-level care. Recently, many of Vohra’s physicians gathered at the Symposium on Advanced Wound Care in Las Vegas, Nevada. 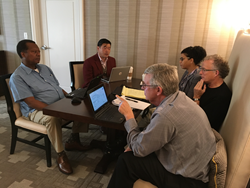 They participated in the educational sessions at the conference, also taking time to learn from the other Vohra physicians by participating in peer review. Vohra often holds their peer review sessions in conjunction with large wound care conferences, such as SAWC. That allows the physicians to also spend time hearing about the latest developments in wound care research and education.